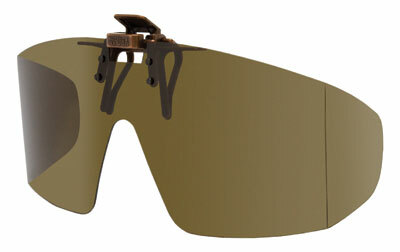 G Wrap® Flip Up - "larger frame styles with peripheral protection" Our "patented, all metal" flip up mechanism securely clips to the top of your plastic or metal frame, allowing you to obtain polarized, 100% UV protection with our superior polarizing lens system, protecting your eyes from the sun's damaging rays and blinding glare. In addition, our polarized lenses are also highly scratch resistant. The G Wrap Flip Up not only provides 100% UV protection but this amazing wrap around design protects your eyes from all angles, giving you a full protection from the sun's damaging rays. You now have the convenience of just flipping them up or down while boating, fishing, or just driving your car. Our patented flip up "all metal" mechanisms are virtually unbreakable, and the metal mechanism from our proprietary "sticky" vinyl clip coating system protects your lenses by preventing slippage and scratching.